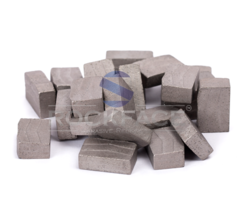 Our product range includes a wide range of m shape cutting segments and m shape multi cutter segments for granite. Blade diameter starting from 1 meter to 3 meter. These diamond segments are fit for the use on multi-blade circular saw for stone block cutting. These segments are used for making slabs of stone block. Segments are available for blade thickness starting from 5.5 mm to 9.5 mm.